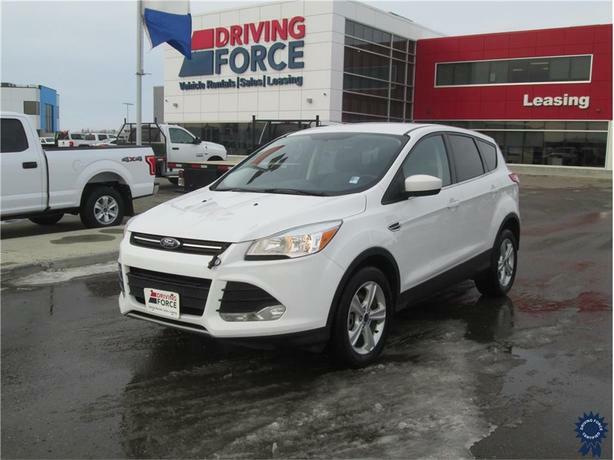 This 2014 Ford Escape 5 Passenger 4X4 SUV has a 6-speed automatic transmission with SelectShift, 3.51 axle ratio, heated cloth bucket seats, front and rear anti-roll bars, electric power-assist speed-sensing steering, permanent locking hubs, front fog lamps, deep tinted glass, SYNC with MyFord Touch Communications and Entertainment, 911 Assist, AppLink, Bluetooth, backup camera, steering wheel controls, USB port and auxiliary input jack, two 12V DC power outlets, 57-litre fuel tank, and GVWR rating of 4,760 lbs (2,159 kgs). The 1.6-litre Ecoboost gas engine provides 173 horsepower at 5,700 RPM and 184 lb-ft of torque at 2,500 RPM. Touch base with us to discuss purchasing or financing options that are right for you and experience the difference you will only find at DRIVING FORCE Vehicle Rentals, Sales and Leasing.